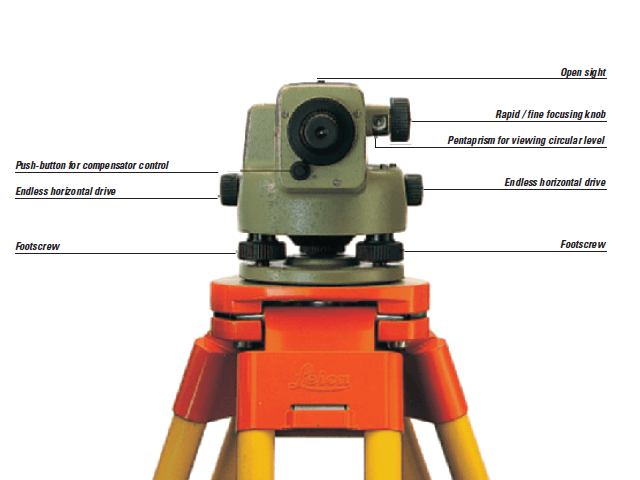 Having been designed by Surveyors and Development Engineers with years of experience and who know what a field instrument has to be able to do, the NA2 universal auto level meets all requirements regarding precision, convenience and reliability, and the rugged NA2 series is indifferent to weather conditions and is extremely reliable in the rough world of the building site. The pendulum compensator is protected against knocks and shocks, thanks to a highly-effective vibration-damping mechanism. The telescope is of excellent quality and gives a bright, high-contrast, erect image, even in poor light – an essential for accurate leveling. 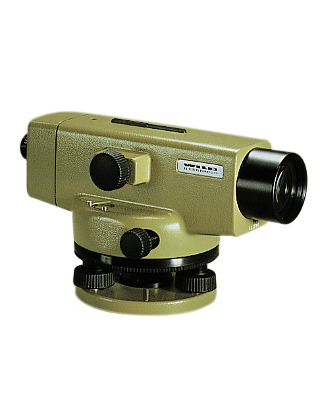 With the standard eyepiece the magnification is 32×, the optimum for most applications of the instrument. Optional eyepieces are available; the 40X may be preferred for precise leveling, the 25X in hot, shimmer conditions. Eyepiece exchange takes only a second or so. The general layout of the controls, the smooth friction-braked rotation of the instrument, and the endless horizontal drive with bilateral knobs, all combine to make the instrument easy to use. Setting accuracy of compensator (stand. dev. ): 0.3"